See more objects with the tag domestic interiors, commercial interior, abstraction, repetition, curtain, furnishing fabric, squares, geometric, commercial, skyscrapers, cityscape, cross-disciplinary. This is a Textile. It was designed by Philip Johnson and manufactured by Arundell Clarke Ltd.. We acquired it in 1956. 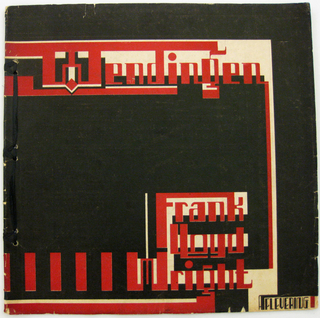 Its medium is cotton and its technique is screen printed with discharge on plain weave. It is a part of the Textiles department. 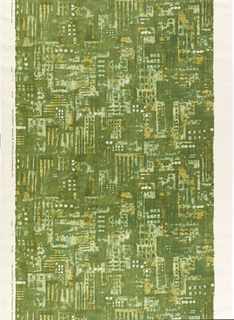 As far as we know, Van Dyke Squares may have been the only textile design by the iconic architect Philip Johnson. 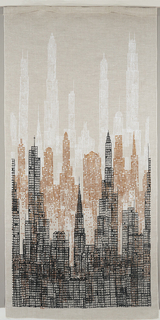 In 1949, when the textile was introduced, Johnson was Director of the Department of Architecture and Design at NYC’s Museum of Modern Art and was in the early years of his career as an architect. In fact, that same year, he completed one of his very first and still most celebrated projects - his home, an ode to Mies van der Rohe, The Glass House in New Canaan, Connecticut. 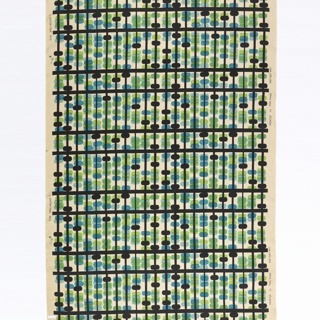 Like many other textile designs of the post-war decade, Johnson’s abstract pattern was inspired by an eclectic source. 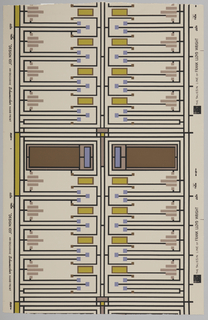 A contemporary article in the New York Times reported that the “random composition of small square blotches” was “suggested by a peculiar defect […] on a Van Dyke print of an architectural plan.” Van Dyke printing was a wet-process reprographic technique used in the early 20th century for making intermediary prints and copies of architectural plans, with white lines on a dark brown ground. 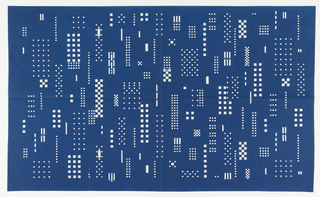 Johnson chose to render the “squares” in his textile design in pure white on a deep blue ground, a dramatic color scheme reminiscent of more familiar architectural blueprints. 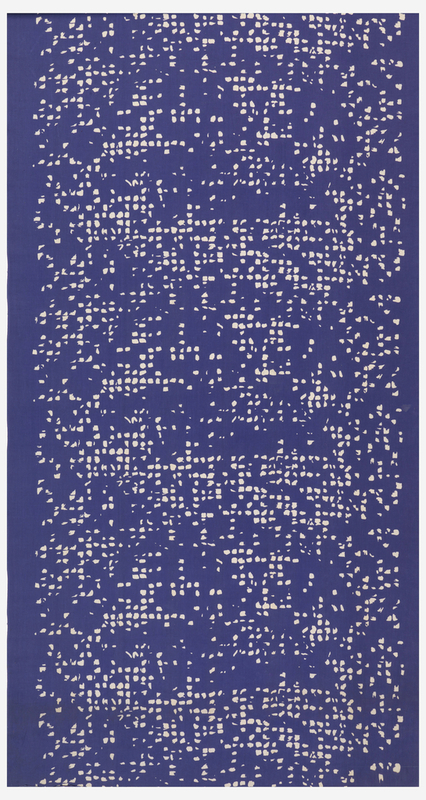 This object was featured in our Object of the Day series in a post titled Effect Before Everything. This object was donated by Arundell Clarke Ltd..